1. It was 60 degrees, and would be below freezing pretty much forever after Tuesday. 2. It was windy/stormy/the indoor was creaking like crazy. 3. I'd have to share the indoor with a random beginner lesson. 4. Connor's mane was approaching Thelwell status. 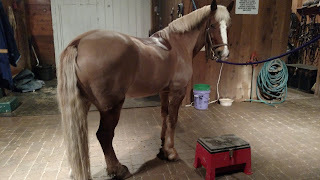 On the one hand, it felt lazy to pull his mane and chat with one of the barn rats and listen to the rain on the roof for an hour instead of riding. On the other, it had to be done sometime before the show on the 14th and this was my last chance to do it without frozen fingers. And sometime it's just nice to stand there and feed him cookies every so often for an hour instead of making him do stuff. Darn you, lucky! I could not get away with that. I have never been good at that! I tried it, and mine end up looking like someone gave a five year old a pony and a pair of scissors. I love doing 'spa days' sometimes instead of riding! And my pony's mane looks similar right now... he's got the feral look going on. I think that's a really good way to enjoy a quiet 60 degree night! Good choice IMO if it means fewer frozen fingers later! Absolutely, take them when you can get them this time of year. I also love mane pulling! I love repetitive motion activities, so therapeutic. Lol, have you met my trainer? We'd get some raised eyebrows if I put him on the trailer for a show with a Thelwell mane. Haha, it's far from perfect! You should see how perfect his Aunt Mary can get them, holy cow. That's what a couple summers of being a professional groom gets you, I guess. No real technique for me, just pull really small sections and go up and down the mane as needed to level it out.